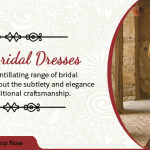 Indo Western Gowns - Your Perfect Evening Dress. Indo Western Gowns have become an integral part of Indian fashion over the last decade. As the name suggests, these garments are inspired by the western gowns seen so often on red carpets and fashion runways across the world. Ideally, they can be worn throughout the year as the nature of this garment makes it extremely versatile in terms of the kinds of fabrics, cuts and styles that can be used. The most popular form of Indian evening gowns is essentially an amalgamation of the western gown and the Indian aesthetics. This means that floor length gowns with embroidery, ethnic motifs and intricate patterns are some of the best examples of the fusion that has been created by designers in India and abroad. At the same time, Indian evening dresses can also include ethnic wear such as lehengas that can be worn for formal occasions but have a touch of western aesthetics merged with the overall style. 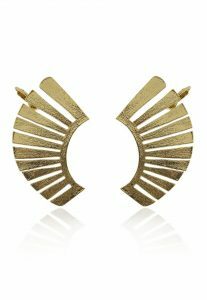 This can be represented in the form of the sleeves, the back, the colors or even the motifs used to create the full look. These garments come in a variety of shapes and styles. The outfit itself can be divided into three main components: the top, the bottom and the stole. The top is most commonly called a choli or a blouse, depending on the style (if it is a crop top that shows off the midriff, it’s called a choli, otherwise one can just refer to the top as a blouse). Blouses for this garment are also available in flattering shapes such as corset shapes, along with variations on the sleeves, back, the work done and so on. 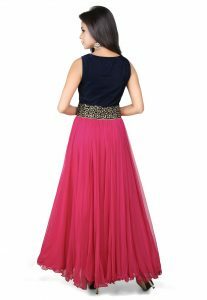 The bottom component is made of a long, flowing skirt with embroidery that complements the style on the blouse. 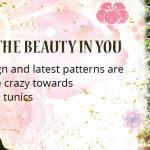 Like the blouse, the bottom comes in a variety of styles such as A-line, peacock, mermaid cut, straight cut and so on. The final component of the garment is the chunni, a heavily embroidered stole that can be worn any way with the outfit. Most commonly, evening dresses from India are worn with the chunni draped over one shoulder. 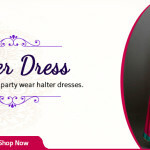 You will also find Indian style evening dresses which incorporate Indian designs of peacocks, fruits and flowers and ethnic techniques like zari, aari, Kundan etc. into a western silhouette. 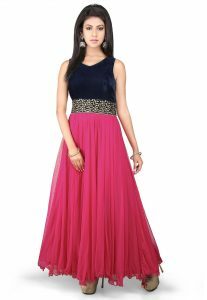 Indian evening gown dresses are complemented well by Indian jewelry such as kundan sets, polka necklaces and earrings and simple gold sets as well as western forms of jewelry like diamonds. 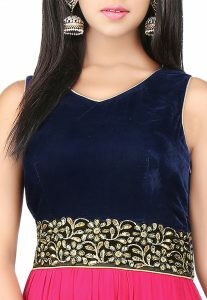 Evening Indian dresses can be accessorized with either style depending on the occasion where it is worn. Indo western gowns are worn mostly to formal occasions such as weddings or ceremonies which is why the embroidery on them usually leans towards the heavier side. For such occasions, Indian designer evening dresses create the biggest impact as they are typically very rich and exclusive. 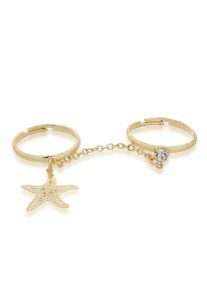 The jewelry to match with such garments must be classy and chic to avoid over-crowding the look. 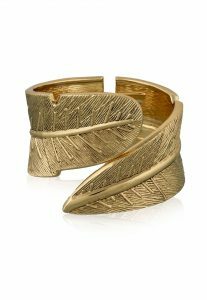 Other forms of jewelry that are usually paired with such outfits include mang tikkas, which were recently brought back into the fashion world through Bollywood films, and bangles. Some women also like to add foot bracelets or payals to long Indian evening dresses for some ethnic flavor. Brides wearing Indian gowns are heavily adorned with multiple forms of jewelry as it is believed to help bring prosperity into the family. This is also why most people are not at a risk of over-doing it with jewelry when this outfit is worn to a wedding. With the Indian evening dress, the shoes can easily take away from or add to the overall look. High heeled shoes are the best option for this garment as they complement the fall of the long, flowing skirt and add a touch of grace and femininity. Many Indian women also choose to wear Indian shoes such as juttis with this outfit if they feel that they are in for a long night. Wedge heels, on the other hand, should ideally be steered clear off as the style of such shoes can be quite jarring when paired with a lehenga. That is basically an example of fusion gone wrong. In terms of the handbags, Indian handbags or even clutches are the right choice. Some of the most commonly carried bags with this outfit include cutdana handbags and moti work handbags. As the aesthetic used while creating them is highly ethnic, these bags can really complement the outfit on the whole. While choosing the ideal handbag, one must ensure that the embroidery or work done on it does not clash with the work on the outfit to avoid a jarring effect.